Many thanks to SWLing Post contributor, Alan Hughes, who shares this article by WRMI’s Jeff White in Radio World magazine. Besides covering updates in the A19 broadcast season, and Radio Exterior de España’s increased broadcasts, Jeff notes frequencies and updates for the International Radio for Disaster Relief initiative. From its infancy since 1920s shortwave radio has been associated with its potential of being a communication tool in emergencies. This use of shortwave radio is still very much present among amateur radio enthusiasts for example, who discovered its long distance properties early in the twentieth century. Amateur radio provides a means of communication on shortwaves and other frequencies “when all else fails”. This role of amateur radio is well recognised, valued and appreciated both by the public and by the world institutions managing and regulating the use of the radio spectrum. In contrast the huge technical potential of international shortwave broadcasting that operates transmitter facilities tens, or hundred times, more powerful than those of amateur radio, remains almost unused in emergencies. At the moment when local and even regional communication and information networks are needed most, they are destroyed or overloaded and the population suffers from an information blackout. Shortwave radio is capable of remaining the only source of information. 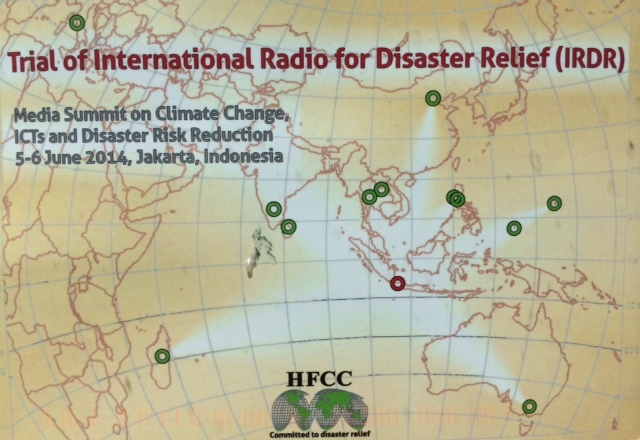 Although the life-saving role of radio broadcasting is widely recognised by the public, and confirmed by surveys conducted after the recent disasters – and even acknowledged by world leaders – no concrete projects have been ever designed and no regulatory framework has been developed. That is why the HFCC – International Broadcasting Delivery in co-operation with the Arab States and Asia-Pacific broadcasting unions are working on an International Radio for Disaster Relief (IRDR) project that is based on the system of online co-ordination of frequencies managed by the HFCC in accordance with International Radio Regulations. Receivers are inexpensive and require no access fees. Shortwave radio is important for people living in remote and isolated regions of the world. It reaches across the digital divide to the most disadvantaged and marginalised societies. This is also in keeping with the Declaration and Action Plan of the World Summit on the Information Society. The annual edition of the World Disasters Report of the International Red Cross and Red Crescent Societies (IFRC) issued in October 2013 stressed again that with only 6 percent of people in low-income countries using the internet in 2011 the digital divide is still stark, and access to low cost media technology is really the key. Both documents are annexes in Section 8 of the ITU-R Study Group 6 Report BT.2266 “Broadcasting for public warning, disaster mitigation and relief”. The report can be downloaded via this link. The HFCC is staying in touch with the Information and Communication Sector of the UNESCO agency on the preparation of the World Radio Days that are celebrated each year on February 13th. Humanitarian aspects of terrestrial broadcasting were also on the agenda of the Global Kuala Lumpur conference in January 2014. Read Opening Remarks. This entry was posted in Articles, Emergency Preparedness, News, Schedules and Frequencies, Shortwave Radio and tagged Alan Hughes, HFCC, High Frequency Coordination Conference, International Radio for Disaster Relief, IRDR, Jeff White, Radio World Magazine on January 31, 2019 by Thomas. Many thanks for sharing this card, Michael! I’m impressed the HFCC issued them so quickly. 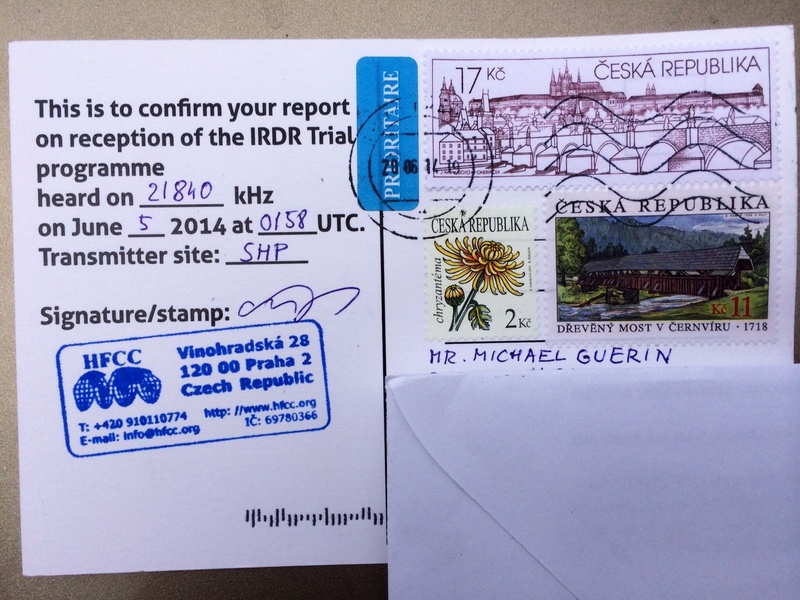 Did you miss the IRDR test broadcast? Stay tuned–I’m hopeful they’ll repeat this test in the future. This entry was posted in Broadcasters, News, QSL Gallery, Shortwave Radio, What's On Shortwave and tagged HFCC, International Radio for Disaster Relief, IRDR, Michael Guerin, QSL on June 27, 2014 by Thomas. SWLing Post reader, Mehmet Burk, has just published information about the upcoming international disaster test on shortwave radio, coordinated by the High Frequency Coordination Commission (HFCC) for the International Radio for Disaster Relief project. Mehmet has details of this June 4 – 5 international radio event on his website: Relief Analysis Radio. 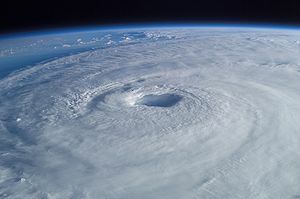 This entry was posted in Articles, Emergency Preparedness, International Broadcasting, News, Preparedness, Shortwave Radio, What's On Shortwave and tagged Emergency Communications, HFCC, High Frequency Coordination Conference, International Radio for Disaster Relief, Mehmet Burk, Natural Disaster Preparedness, Relief Analysis Radio, Weather on April 4, 2014 by Thomas.